The Mkandawires (pronounced makandaweary) hail from Great Britain. Tamika and his wife, Leah, met ten years ago in London. Tam was a star football player (or what Americans call a soccer player) with the Leyton Orient Club, and Leah was a commercial model for several well-known organizations, and then an assistant in the business development department at Christie’s, the well-known auction house. “I always wanted to play in the States,” Tam stated while reminiscing about the life-changing decision to leave their home country in 2014. “It was a hard decision to make,” he added, “but it was a once-in-a-lifetime opportunity and we jumped in head first!” Luckily, Leah loved the idea of living in the US, too. And, Mimi, their young daughter who was only months old, doesn’t have a shy bone in her body. She is known throughout the neighborhood for her outgoing personality. Jumping in head-first is apparently a family trait for Tam. His British mother was the first ‘jumper,’ becoming a volunteer teacher in the African country of Malawi for nine years. His Malawian father came from a small farming village and attended an agricultural college. In 1984, when Tam was only three years old, they made the ‘leap’ from Africa to England settling in the town of Rugby (where the game was invented). But soccer – not rugby – won out for Tam. But, just how did this soccer opportunity in the States come about? 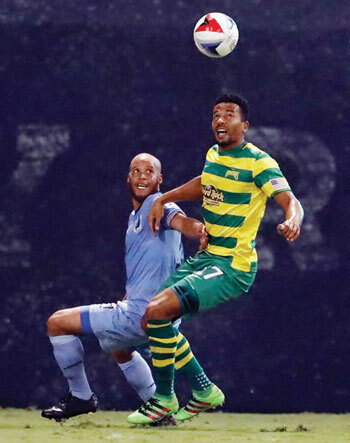 “Out of the blue, Rowdies general manager Perry Van der Beck, called me with an offer to play on the American team,” Tam noted with a happy smile. That offer was thanks to the recommendation of Stuart Campbell (Rowdies assistant coach at the time) who as a fellow Brit, played against Tam in England. British soccer players are making their mark in Tampa Bay! But, they adapted and discovered St. Petersburg. “Now we love it,” exclaimed Tam. “We used to drive around Coffee Pot and Snell Isle and the waterfront” thinking this was where we wanted to be. In 2016, they bought a house in the Old Northeast and started renovating right away, even though Leah was expecting their second child, Remi. They did manage to move in before Remi was born, with the help of grandparents coming over from England in turns. 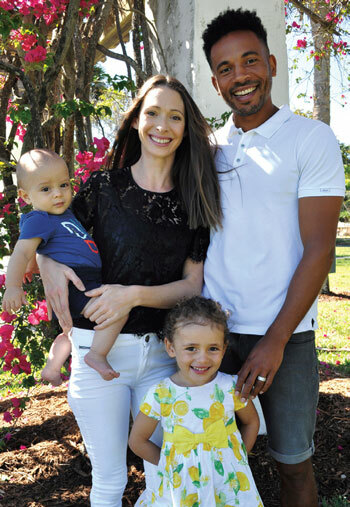 “The neighborhood is great,” Tam stated, “everybody is friendly and we feel really safe and at home here.” He feels at home on the Rowdies, too. He had the potential to become a professional rugby player at home in England since he was captain of his high school rugby team, as well as the soccer team. However, Tam’s love for soccer won out. After switching to soccer, he started his career at Premier League team, West Bromwich Albion. In pursuit of first-team football (first 11 players in the game), as an ambitious 21-year-old, Tam captained Hereford United FC (Football Club or ‘team’) into League 2 and was awarded Player of the Year in 2005/06. Tam moved up to a bigger contract with a bigger team – Leyton Orient FC, then Millwall FC – and then to captain of our own Rowdies last year. 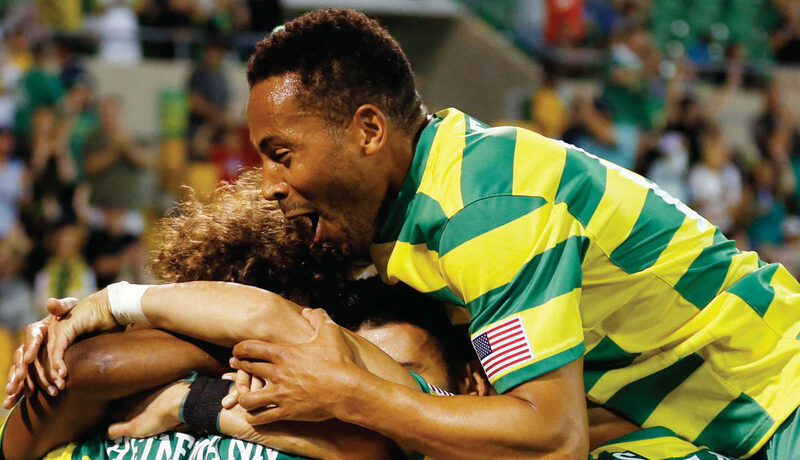 Now there’s a chance the Rowdies will move to Major League Soccer (MLS) in the near future. “We should know something for sure around November,” Tam revealed. Adding, “This is great for the Rowdies and St. Petersburg. It will make people more aware of soccer and the stadium. 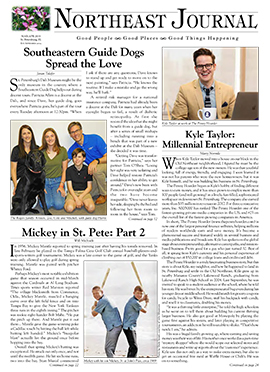 Bill (Edwards) is very motivated to build up soccer and the city of St. Petersburg.” Now Tam also has big plans for soccer in the area… another more-about-that-later teaser. “I’m thinking about my longevity in the game – what about the future? Very few athletes are prepared for retirement. This year has really helped me – you’re not always in control and have to roll with the punches.” So, what’s next for a 30-plus-year-old soccer player? “I’m motivated to helping youth soccer in America,” Tam pledged. “I want to use my experience playing professional soccer for a long time, to start a soccer school here.” Wow! Tam the Soccer Man will be Tam the Soccer Academy Man! Patience + persistence + resilience = Soccer Man and Soccer Academy here in Tampa Bay!